Mrs. Mamdouha El-Sayed Bobst was a visionary philanthropist and champion of education, medical care and social justice, who served a number of different international organizations throughout her career. Mrs. El-Sayed Bobst was born in Tripoli, Lebanon in 1925. She received her Bachelor of Arts in Arabic from the American University Beirut and in 1947 went on to earn a post-graduate diploma from the University of Birmingham, United Kingdom, and a Master’s in Public Health Education from UC Berkeley, USA. Health issues, education, and social justice were all significant to her and would go on to shape her career and philanthropic activities. Brilliant, charismatic and fearless, she began her career in Libya and served as a public health consultant with the World Health Organization. She founded the first school of nursing and established Libya’s national public health system. Later she worked for UNICEF and the United Nations, where she was appointed to be a delegate to the UN General Assembly, one of only a few females to assume such a post, by Lebanese Prime Minister Rashid Karami. In 1961, while still serving at the United Nations, Mrs. Mamdouha El-Sayed Bobst married Elmer Homes Bobst, a successful businessman, and pharmaceutical executive. Together, they created The Elmer and Mamdouha Bobst Foundation in 1968, of which Mrs. El-Sayed Bobst was President. Over the years, Mrs. El-Sayed Bobst made significant and transformative donations to some of the world’s most distinguished institutions. 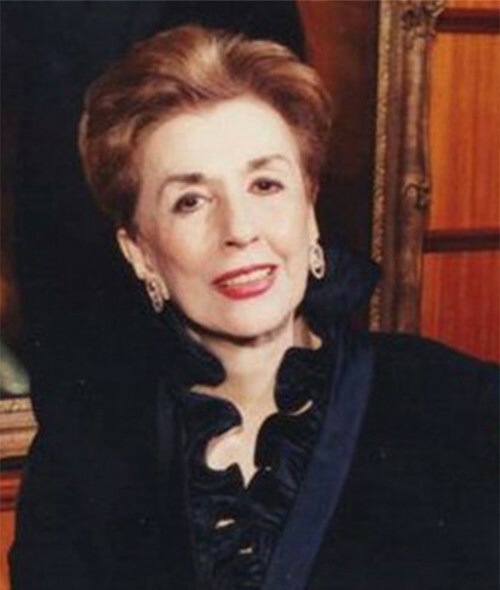 Her philanthropic journey was both impressive and extensive and included numerous trustee or advisory roles at the American University Beirut, the American Cancer Society, the Memorial Sloan Kettering Cancer Center, New York University and its Langone Medical Center, the Bobst Hospital at the Animal Medical Center, the Boards of England’s Royal Society of Medicine, the Kennedy Center for the Performing Arts in Washington D.C., the World Rehabilitation Fund, the Cancer Control Program of the National Institute of Health in Bethesda, MD, and the Foreign Policy Association to mention only a few. As a result of her remarkable and far-reaching work, Mrs. El-Sayed Bobst has been the recipient of NYU’s Presidential Medal and Gallatin Medal, the Humanitarian Award of the United Nations Women’s Hospitality Committee, the Medal of the Order of Cedars of Lebanon; The Rusk World Rehabilitation Fund Award, and the “Top Dog” Award from the Animal Medical Center. Mamdouha also received an Honorary Ph.D. in Humane Letters from Hahnemann Medical College. Mrs. Mamdouha Bobst passed away in September of 2015.